I've study the picture but...looks more complicated then I thought!. 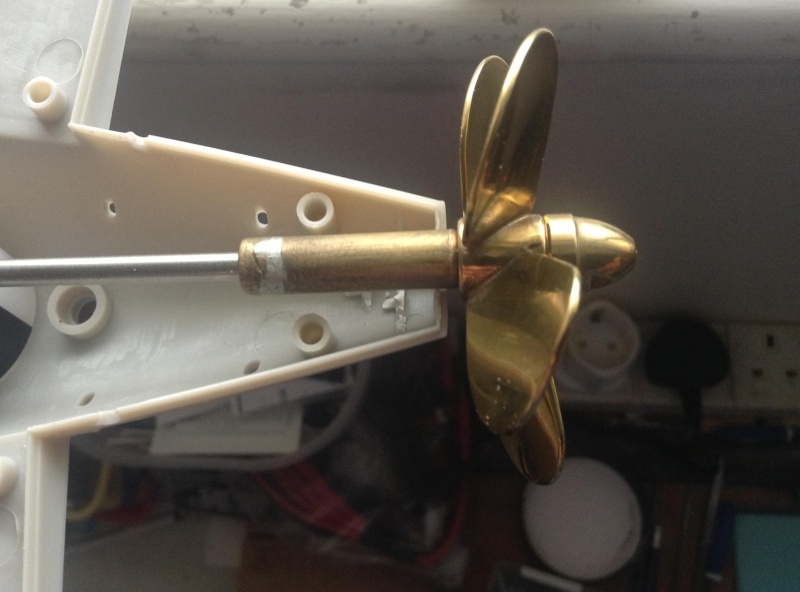 When You'll feeling well and had some time,can You make a CLOSER picture only with the Mini Gear it self?.Because from what I see in the picture the Motor Shaft and the Propeller Shaft are Directly Connected,or is guest a wrong impression. Sorry to bother You four these details but I NEVER SEEN such an arrangement for wheels. Take Your Time I not in a hurry. 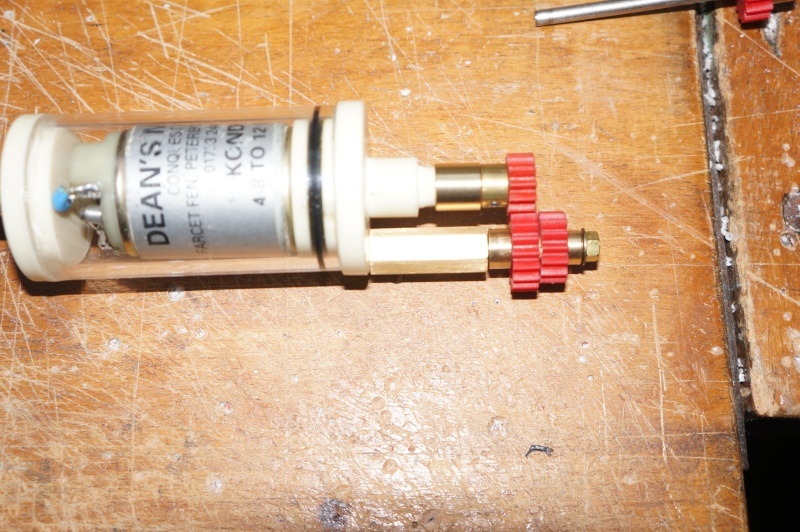 Picture one: the motor is now in direct drive, no gears are connected. The two gears remaining are in idle position. 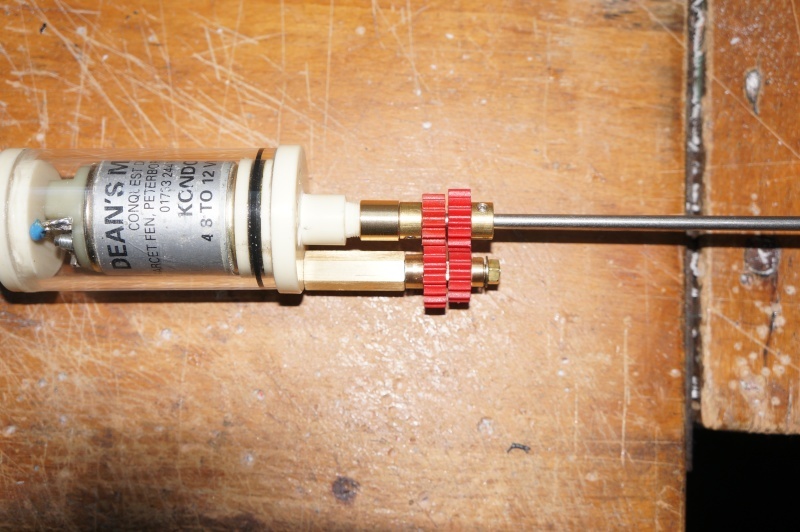 Picture two: The gearbox is now connected to the motor shaft. Power is from the gearbox, reduced to 2:1. Picture three: The prop shaft is now engaged, power is now to the prop shaft, 2:1 reduction, more than capable of turning the large prop. 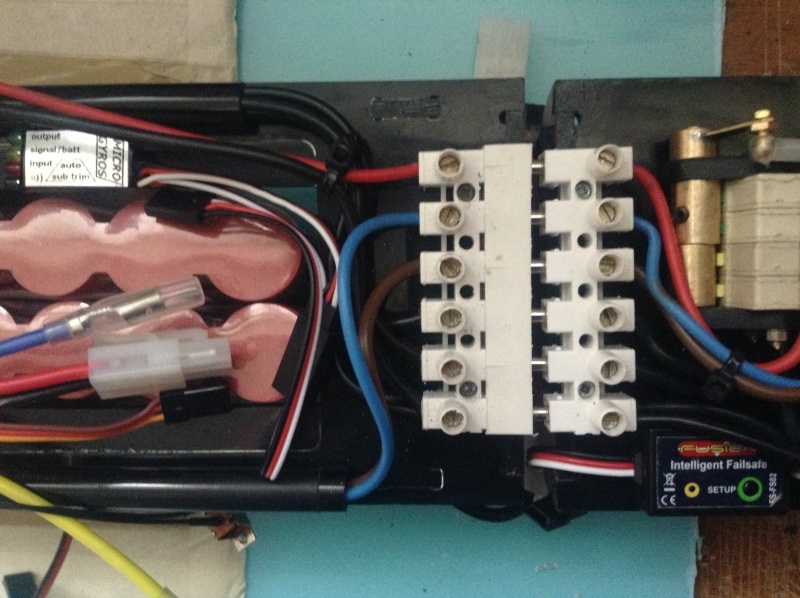 The motor box can be positioned anywhere I need to position it, which is very useful when it comes to final installation. Hope this helps you understand it? Onwards with the build...the hull sections are now glued and screwed together. 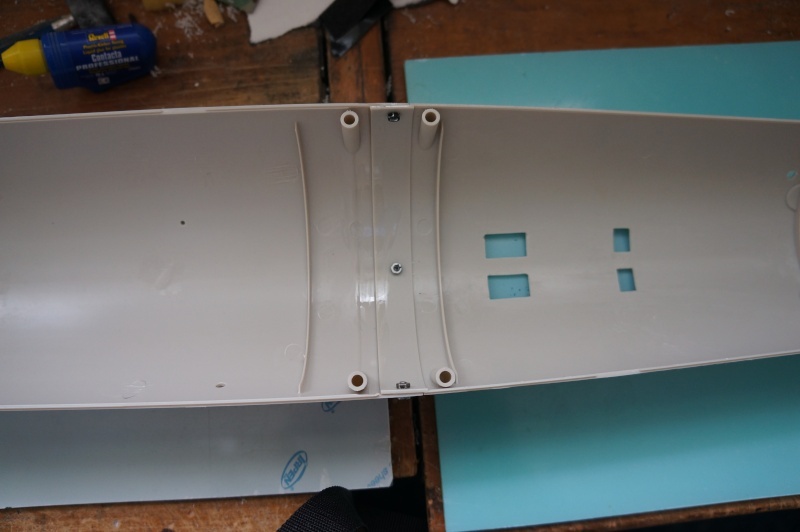 Once the glue has dried, I'll remove the three screws and replace them with short pegs made from sprue, when sanded level they shouldn't really show. It was more than I aspect ed.Now is Cristal Clear.These is what it means "PROFESSIONALS" skills. Keep on,"I am watching YOU!". I'm glad you understand what goes where now, Marius...next job on the list is make a start on the supports for the module so it sits properly in the hull without moving. Bloody marvellous mate, thanks so much for that. I'll do them tomorrow if I can and get them down to you. Silly, silly boy...no problems, no rush mate. 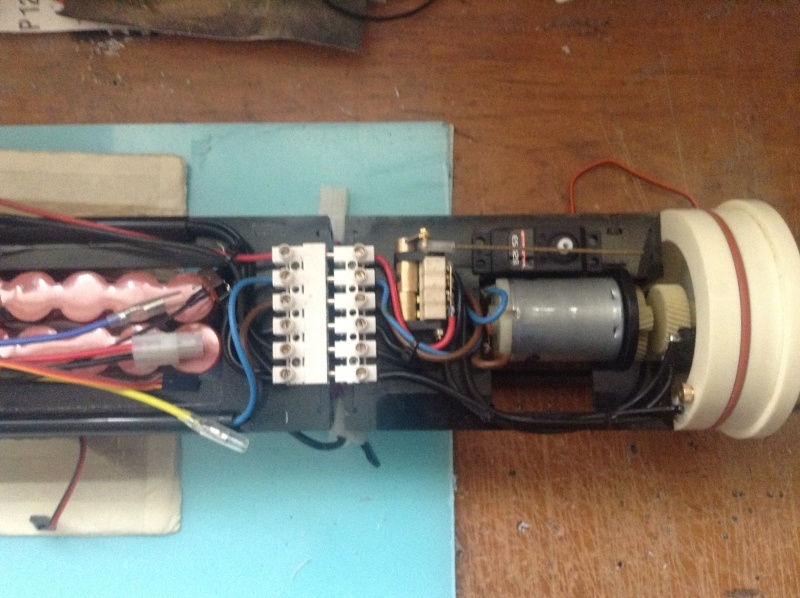 Slow day today, these damn fingers refused to cooperate, but I did manage to get the piston tank switcher servo installed, and the front plane servo is in position. Tomorrow, fingers permitting, I want to get the esc and the rx installed. Whilst waiting for a couple of bits to arrive, I thought I'd make a start on the installation of the prop shaft and supports. 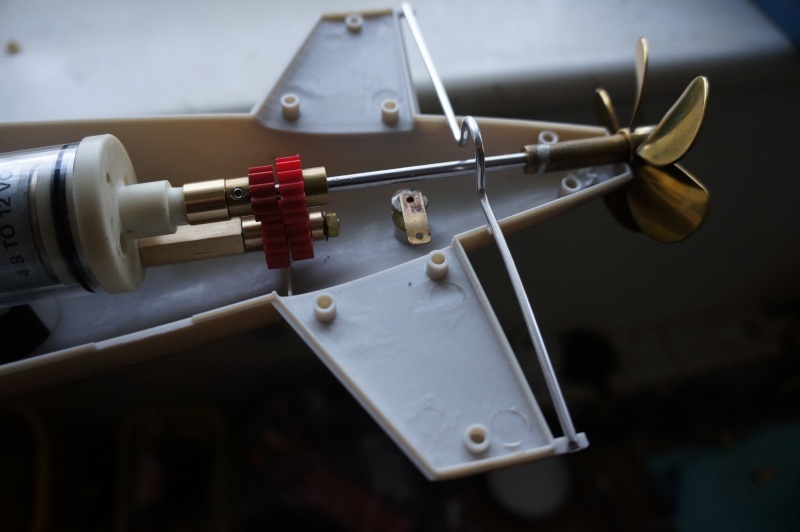 I've made up a very short prop tube, chewed out a couple of pieces of plastic that weren't needed, and so far it fits ok. Next up is to make the support for the shaft at the gearbox end, and then I can assemble everything. Whilst you lot have been indulging yourselves in turkey and alcohol, I've been cracking on with the Skipjack. I've got the rudder sorted out, and now I'm doing a dry run of the rear vanes cross shaft. I just wish that my hands and fingers would cooperate with the rest of me, then I could crack on some more. The module is so simple mate, when I first got it it looked far too technical for me, but when you actually look at it it's exactly the opposite. Every part just follows on to the next part, and it all just literally plugs together. The idea of having a tank at each end is ideal, it automatically balances itself...to quote from a well known meerkat...simples! sorry to hear about your hands one thing i would hate to have problems with im good with my hands but reading and writing no hope for me as you may be able to tell ha ha. I must say WTC fits together so well ron p has been on the sub scene for years had his own company R&R model engineering at one time got his 1991 cataloge sitting here. Does ron still make bits and pieces for the general public? It's been a real pain this year, Geof...my hands swell up like up a couple of toads, by arms and shoulders can seize up completely sometimes, but I will not let it beat me building the Skipjack. 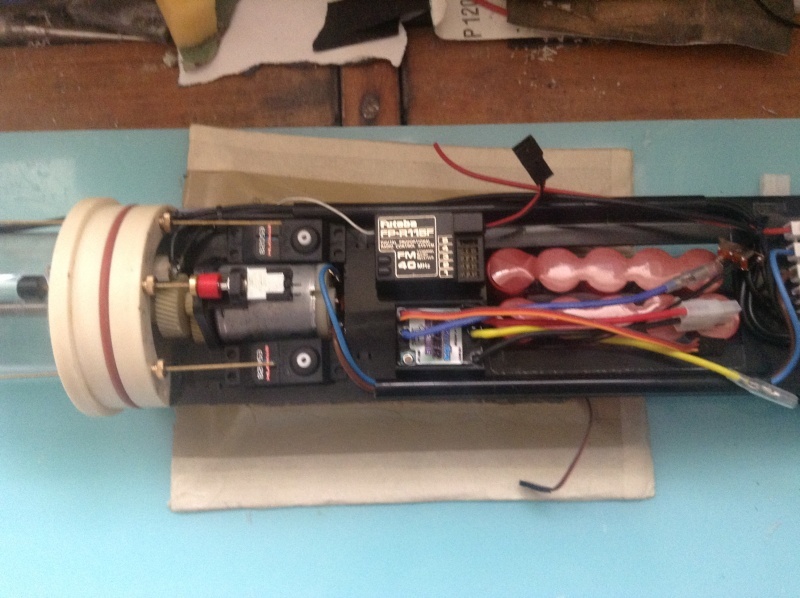 Ron has been about as long as I have in the submarine hobby, he's had a few ups and downs with it like we all have. I've known him for the best part of forty years or so, he made the SALCON for my Patrick Henry. He's still building parts, so if you want anything, give him a call, he'll build what you want. At this point in this topic, I should point out that the AMS does not endorse any manufacturer or the goods that that manufacturer supplies. Any manufacturers that I have named are my own personal preference, and my own personal recommendations. I will also add that I have no commercial or personal connection with RonP (R&R Model Engineering) other than that of being friends with Ron for a lot of years, and being a satisfied customer. It is a great shame that there are persistent rumours about R&R from the dim and distant past. 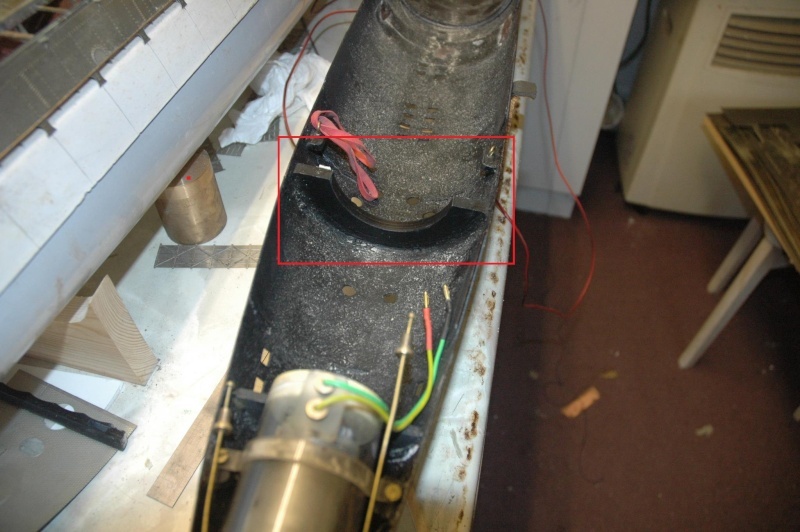 A problem has arisen due my module assembly...having had a chat to Ian at the Component Shop about wiring my packs in parallel, I was strongly advised not to do it...possible back charging and damage to the cells were two of the reasons he quoted me, so a rethink was required. 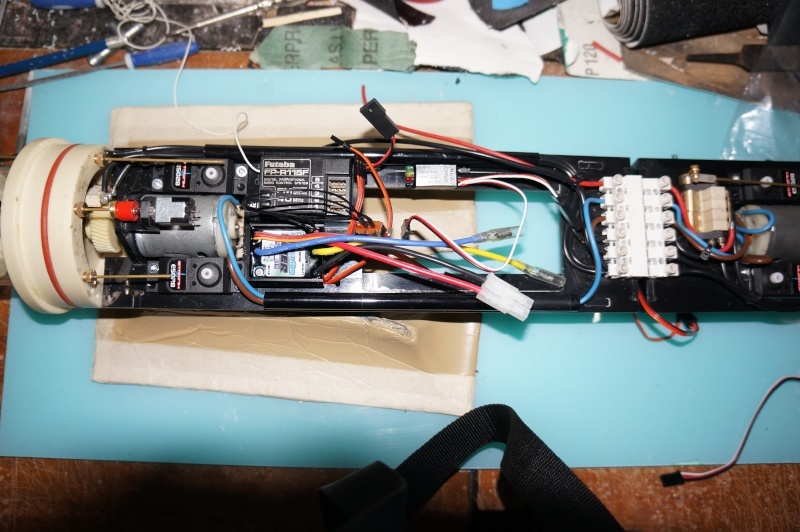 The module was designed around the two battery packs, and the central hole in the tray was cut to fit them, so that had to be taken into consideration. 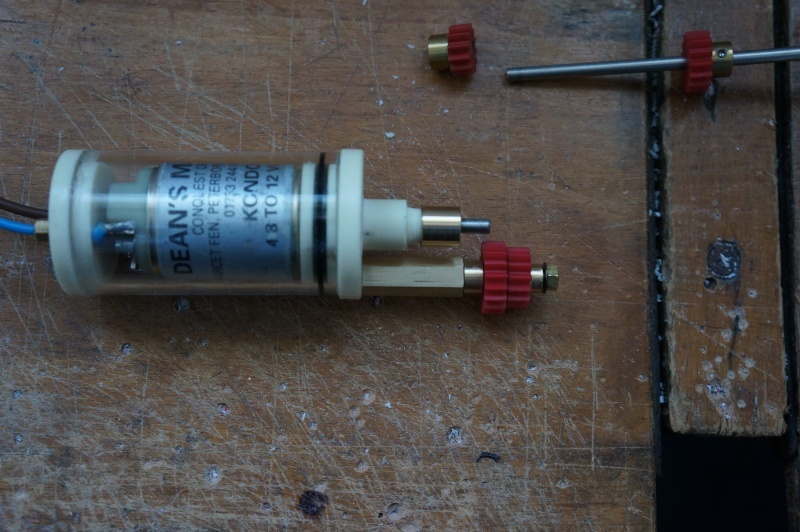 I had several ideas floated past me, including one from Nigel which I liked, but after a lot of umming and aahing over what course to follow, and seeing as how I'm a conformed dinosaur with all things electrical, I've decided to use the good old fashioned 6v 4.5a/h gel cell battery. The size is practically the same as the twin NiMhs packs, and the gel cell is a nice smooth fit in the tray, so that's the decision I've taken. 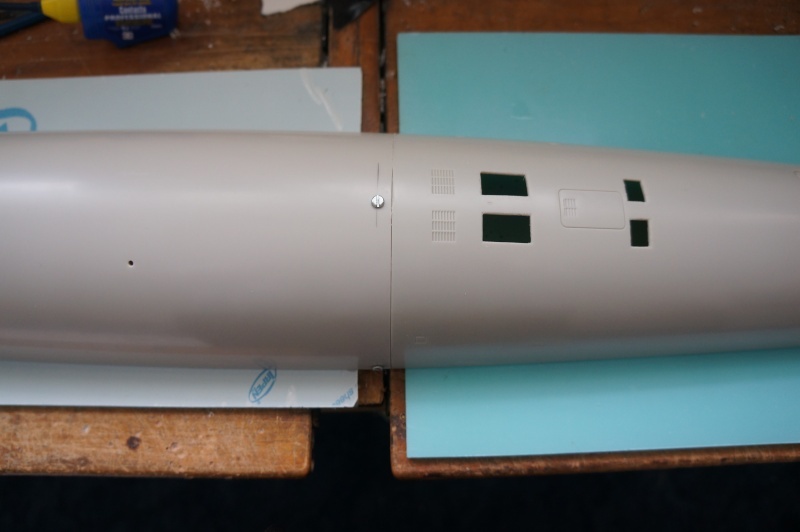 I tell you what Geof, this blasted RA is no fun...a couple of years back the Skipjack would have been finished and I'd have been half way through another project, but now....well, I'm lucky to get a couple of hours a day when my hands cooperate enough to get some work done on it. Although the AMS isn't allowed to endorse any company or manufacturer or their products, I think it's good to name the ones who make a good product and offer help and assistance, or name those who don't. At least that gives the guys an idea of who to buy from and who to avoid, and to do their own research into who they spend their money with. I have had dealings with Mark at MMB...some good, some not so good, but he's one of a small band of manufacturers who sell sub related stuff, so more power to him. The hobby needs these people in order to survive. Same applies to Ron, he's been around model subs for a lot of years, and I've known him for most of them. His stuff is good, it works, and it's been tried and tested in his own boats, so that's good enough for me. Oh, nearly forgot...guy on the Mayhem forum has a Futaba Skysport 4 on 40mHz for sale...look here. A "pottering" day today, these bloody fingers have a mind of their own sometimes. 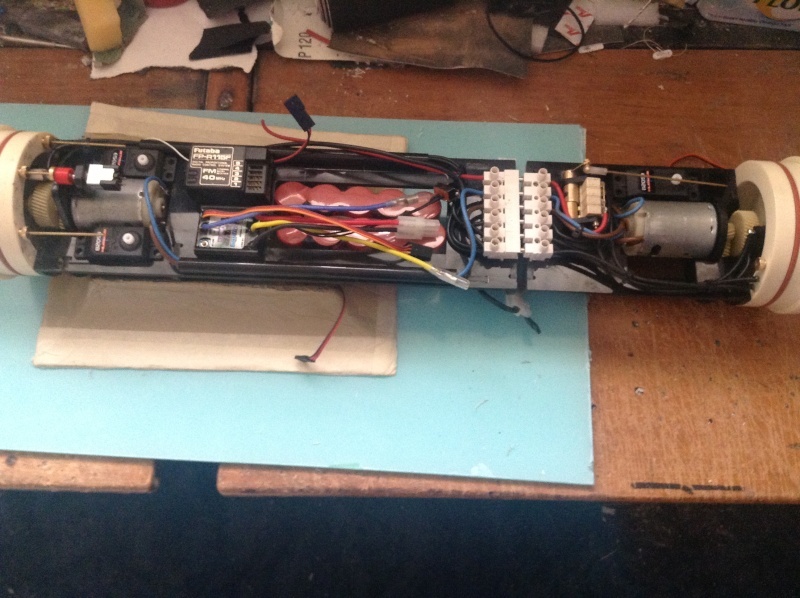 Anyway, I've managed to get all four servos installed and screwed in, the esc and the leveller are all fitted into position...just the wiring to tidy up now, but that's for tomorrow. 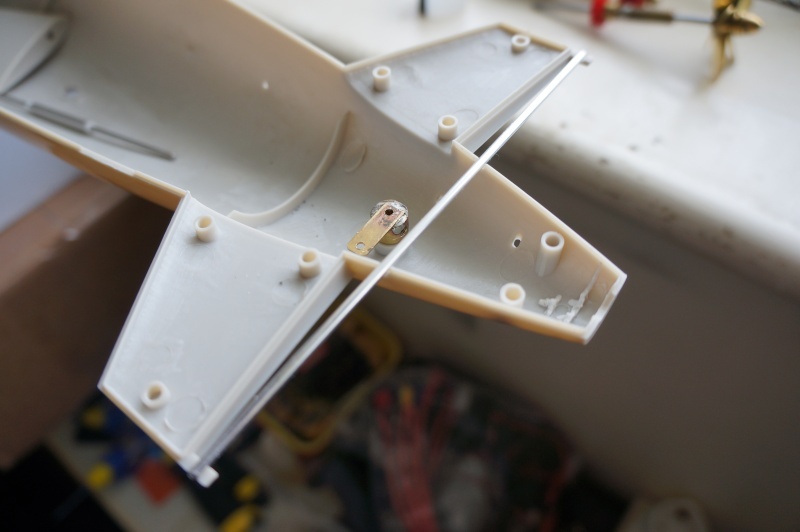 Also on tomorrow's agenda is to make the linkages for the rudder and rear 'planes and get them installed and working.